Product prices and availability are accurate as of 2019-04-05 12:37:22 UTC and are subject to change. Any price and availability information displayed on http://www.amazon.com/ at the time of purchase will apply to the purchase of this product. Mix it up in the kitchen with the joyful, stylish dash of Color provided by the durable Paula Deen signature pantry ware 2-Quart melamine mixing bowl. 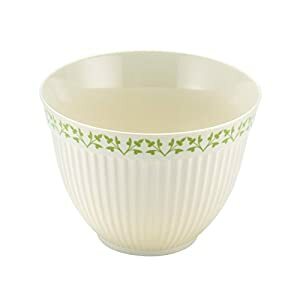 This sturdy mixing bowl from Paula Deen is perfect for blending batters, mixing sweet and savory doughs, and more. With its attractive fluted exterior and patterned rim, it's even special enough for table service at the next mealtime. Use the bowl to beat the ingredients for the lady's perfect scrambled eggs, or to hold a few tasty bananas handy on the countertop for a healthy between-meal snack. Like the rest of the Paula Deen collection, her signature pantry ware puts a contemporary twist on classic kitchenware. The melamine bowl is strong, sturdy, and top-rack dishwasher safe so you can spend less time in the kitchen and more with friends and family. The bowl's rubberized base ring helps prevent slips and slides on the countertop. Best of all, this handy cooking prep necessity matches other Paula Deen pantry ware and other kitchenware products for more coordinated home style. Kitchen prep is easy, when cooks are mixing up tasty foods and ingredients at home with the sturdy, versatile Paula Deen signature pantry ware 2-Quart melamine mixing bowl.